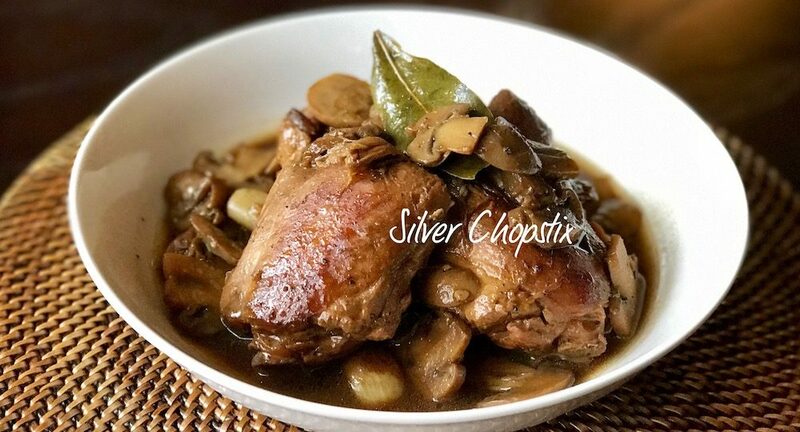 If you are Filipino, you probably grew up eating adobo. This is a staple in most Filipino homes and each family usually have their own way of preparing it. As I have mentioned before this is flavored by a combination of soy sauce and vinegar. To make this recipe work you need to get the Filipino brand soy sauce, I use Lauriat because this is what my mom and grandma has been using. There are different brands of Filipino soy sauce in the market and you can choose any you like. For the vinegar, you need to use cane vinegar, the most popular Filipino brand in the market is Datu Puti. This is just my own personal taste, you can use any brand cane vinegar you can find. To make, place 1.5 lb chicken thighs (preferably bone-in) in a pan. To this add 1/4 cup soy sauce, 1/4 cup vinegar, 6-8 cloves smashed, 1 tsp. ground black pepper (you can use black peppercorns) and 2 bay leaves. It is better if you let the chicken marinate for at least one hour. But if you don’t have the time you can just immediately cook this over medium heat. Let it come to a boil, lower the heat and let simmer for a couple of minutes before covering and continue cooking for 20-30 minutes. Check your meat after 15 minutes, add about 1/4 cup water if you think it’s drying out. 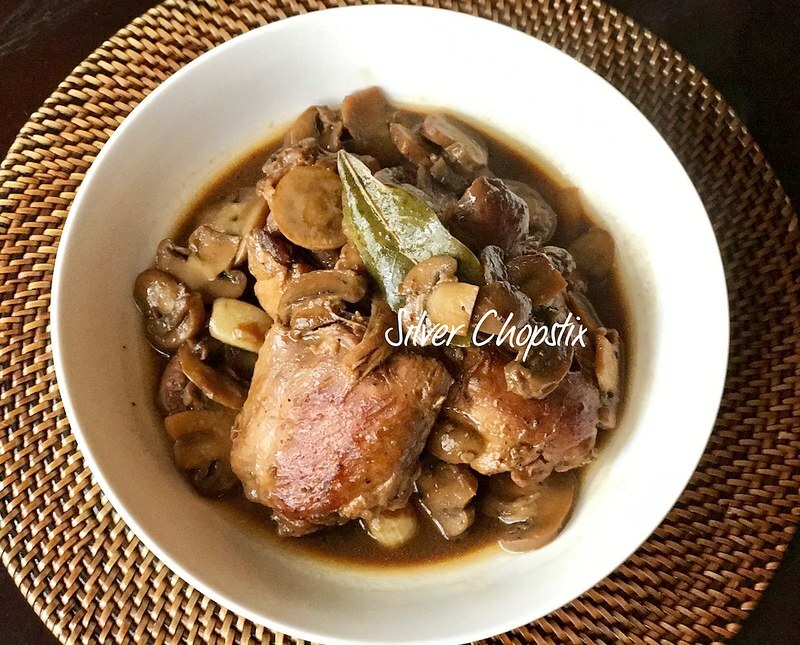 When meat is done, turn off heat and remove chicken from sauce. Get a non-stick frying pan and add a bit of oil. Fry your chicken until nice and brown on both sides. 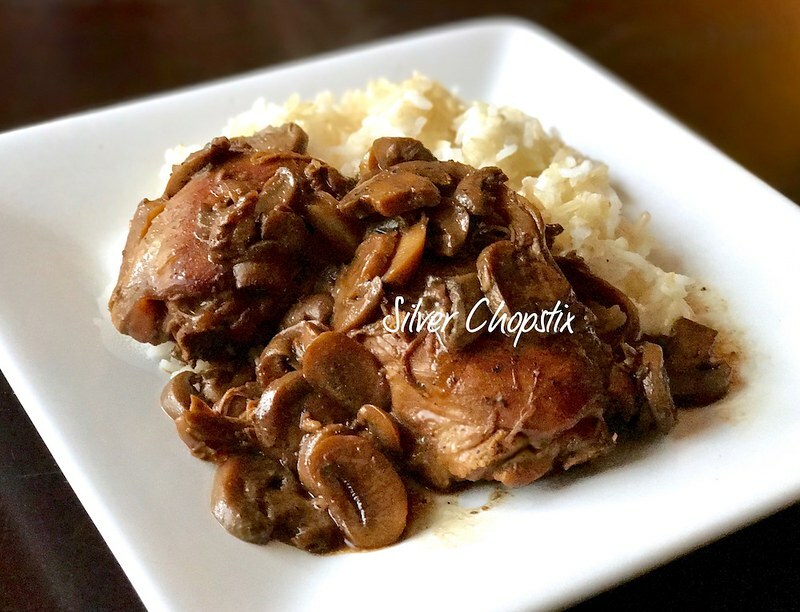 This is entirely optional but I like to add mushrooms to my adobo, so what I do is take a can of drained sliced mushrooms (fresh white mushrooms is better) and cook it in a little oil until brown before adding this to the pan with the chicken and sauce. Let this cook until sauce has thickened a bit, this will only take a few minutes so better watch your pan. Serve immediately with steamed white rice. This actually taste so much better the day after so make sure you have leftovers.